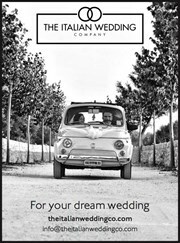 If you are getting married and you love Italy have a look at our website. We would love to help you organising your wedding in Puglia. Please contact us and we will give you all the information you need. Hi Giorgia! Love your website. There is nothing like a beautiful Italian wedding. The colors of Italy, the warmth of the people and the tastes of such a rich culinary history. Good do luck to you in planning this new season of weddings. If you need a photographer for any of your events, don't hesitate to contact me!